Pastor Jung realized the principle of erecting rocks from erecting a relatively small rock on the Front Mountain Rock Landscape. He did not learn the principle of erecting rocks by professional landscapers, but from God himself. When Pastor Jung first began the construction of the Front Mountain Rock Landscape, he brought in professional landscapers from outside of Wolmyeongdong to do the job. However, when he watched them work on the construction, Pastor Jung felt that the rock landscape was becoming neither mysterious nor magnificent. It needed: big rocks for it to be magnificent; dimension for it to be mysterious; and harmony for it to be beautiful. But the workers didn’t seem to know about these things. When Pastor Jung erected a rock after receiving an inspiration from God, the workers only laughed. When Pastor Jung erected a small rock next to a pine tree on the Front Mountain, the experts said to him, “The rocks should be laid flat, not erected upright.” However, while he was erecting the small rock, Pastor Jung realized the principle of erecting rocks. Once he erected the rock, he could see its image; it looked like it was alive. The rock didn’t seem to be very special; however, when Pastor Jung set it upright, its image was beautiful – like an image of a person. Through this rock, God made him realize the method of erecting magnificent rocks. A natural revelation came to him through the almost acrobatic movements used to erect the rock. He made the rocks into art pieces according to God’s design. The so-called “experts” all insisted that the rocks would crumble if they were stood upright; they told him not to build the rock landscape in such a way. Indeed, human beings take action only according to their own level. Ultimately, the Lord inspired Pastor Jung to send the experts home, and he started to build the rock landscape along with other church members. Through prayer, Pastor Jung received the plan to build to the rock landscape in a magnificent way. He also received the design for the waterfall and the spring at the bottom, so that water could flow out as a waterfall. Because there was nothing to learn from the experts when Pastor Jung watched them carry out the construction, he and other church members began to erect the rocks according to the design God gave them. This small rock was the first rock that Pastor Jung erected as part of the rock landscape on the Front Mountain. By realizing the principle of erecting rocks through this small rock, he was even able to erect big rocks that weighed up to 87 tons – in thrilling ways and on steep slopes. At first, Pastor Jung did not even think about setting the rocks upright. But one day, workers brought in this sharp rock. They set it upright because it would not have fit if they laid it down; it looked good. 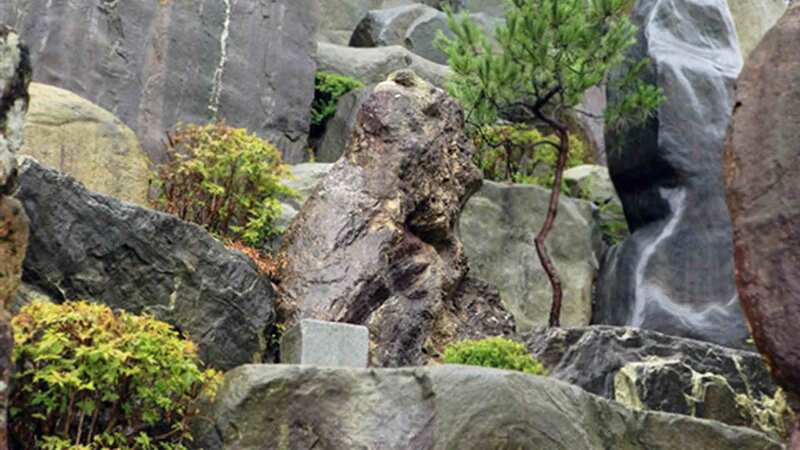 After that, they started to build the landscape by erecting rocks. Like this, nothing is completed in one day. You start with something small, and proceed little by little. The erected rocks of the rock landscaping are not just rocks. They carry deep meaning behind them as well. They represent the spirit of Providence, carries the meaning of “resurrection,” symbolize the central figure, represent head leaders and symbolize a conductor. Thanks for sharing how it all started!